Here is an area of electronics that will be foreign soil to most Gen-Xers and Millennials - troubleshooting your malfunctioning radio, phone, television, garage door opener, kitchen appliance, etc. Admittedly, most modern devices are designed and priced to be replaced rather than repaired. Relatively cheap product replacement and service plans keep them going for a year or three until they are obsoleted by newer devices with whiz-bang additional features. However, there are many of us still around who are born to tinker and are too cheap to bear the thought of throwing something away before at least attempting to fix it. I have written often about how many times problems have disappeared merely by cleaning connector contacts. Sniffing out overheated components and doing a visual scan for broken or cracked solder joints are other very useful tactics. You would be surprised at how successful you might be. Before closing, I need to say I don't disparage all under-30's since I have marveled at the genius of the mostly younger "Maker" community and their collective creativity. Neither do I claim that all over-40's are natural and willing fixers of all things. We are kindred spirits all. Barney had been working on a combination AM-stereo FM and 8-track tape player for half an hour, grumbling under his breath all the while. Finally Mac, his employer, switched off the sweep generator he had been using after replacing an i-f transformer in a TV receiver and asked, "OK, Irish, what's all the muttering in your beard about?" "Aw, I'm sick and tired of having to work on foreign-made transistor equipment for which we have no service data. It's like fighting with one hand tied behind your back." "I know," Mac sympathized. "More and more of this equipment comes into the shop every day: transistor radios, hi-fi's, tape players, and recorders, all bearing names we do not recognize. Almost no information is available on many of these units. If any helpful data came with the equipment, the owner threw it away or lost it long ago. The model number, and quite often the make itself, are not listed in the index of our service literature. If a rare wiring diagram is found on the chassis or in the cabinet, it's about the size of a credit card and of little help. "Now servicing without service literature can be tedious and time-consuming; yet a diagnosis and repair of a piece of this maverick equipment must be made quickly to turn a profit. The owner simply will not pay for a great deal of time spent on it. Replacement cost - especially of the small radios - is low enough that the customer will buy a new receiver if the repair cost exceeds a few dollars." "Yeah, I know," Barney chimed in. "Many smart technicians refuse to touch one of these 'Made in Japan, Hong Kong, Taiwan, etc.' electronic devices. They figure they will invest more time in flying-blind servicing than they will be able to recover in charges." "I don't think that's so smart," Mac said. "Any time you see a service going begging because it has disagreeable features, you're staring an opportunity right in the face. Garbage collectors, plumbers, and undertakers have found this out, and they seldom die broke. The trick is to find ways to nullify the unattractive qualities of the work for you personally while these same qualities scare off your competition." "Sounds good," Barney said dubiously, "but how are you going to take the blank, blank headaches out of servicing without service data?" "By using your knowledge and experience to work out a diagnostic procedure that keeps unnecessary moves to a minimum, makes maximum use of generalized service data, and employs different techniques than the ones used with service data; then stick to that procedure religiously. Check the Easy Things First. "Take that business about keeping unnecessary procedures to a minimum. Nothing is more frustrating than to remove a hard-to-get-out chassis for a lot of fruitless voltage testing only to discover the trouble was a broken antenna lead you could have repaired in a minute. Always check easily repaired possibilities first. Battery voltage and current drawn should be checked routinely, even if the customer says the battery is brand new. It could have grown old on the shelf, or the set could have a high current drain that exhausts the battery quickly. The milliammeter can be inserted in a snap-connector battery lead easily by removing one snap and using the meter leads to restore the connection. In case individual cells in series furnish the current, use a special jig made up of a couple of pieces of brass shim stock cemented to opposite sides of a piece of thin fish paper. When this is inserted between the end connector of one of the batteries and its contact, milliammeter leads touched to the two pieces of shim stock will read the total current being consumed. Your experience will serve as a guide to normal current for the number of transistors used. "Carefully look over the chassis with a pair of magnifying glasses for loose connections, broken wires or charred resistors. Look especially for dangling fine wires going to the antenna. These leads are often broken by the customer in changing batteries or in attempts at do-it-yourself servicing. With the volume full on, try gently moving resistors, capacitors and i-f cans, with an insulating diddle-stick. Be sure to wiggle the tuning capacitor. Quite often one of its solder connections to the board is broken when the radio is dropped or by rough handling of the tuning knob on direct-drive tuning capacitors. Gently flex the printed circuit hoard itself, especially along the edges. What you're hoping for, of course, is a sudden restoration of normal functioning, indicating a broken or loose connection has been temporarily corrected." "If you can't find anything wrong that way, do you take the chassis out and do voltage checks on the back side?" 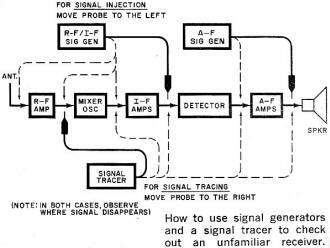 Signal Injection and Signal Tracing. "Not yet. The next thing to try is signal injection and/or signal tracing. With the proper equipment, even voltage checks can be made from the top of the PC board. Just listening for a click when the set is switched on will tell you if the output transistor is drawing collector current and if the output transformer and speaker voice coil are O.K. If you hear the click, they are; if not, something is wrong with one of these components, Another crude signal-injection test is to touch the 'hot' or center lead of the volume control with the volume full on. If this produces a quite noticeable hum, you know a signal can pass from the volume control clear through the audio amplifier. "But it is usually better to use signal generators for injection and a signal tracer to pick oft the signal at various points 'downwind' from where you put the test signal in. Look at this diagram I've drawn. If you know the audio amplifier is working, you can start right in by putting an r-f signal into the antenna and picking it oft at the detector diode or as far forward as you need to go to pick up the signal. You can zero in on the defective component that is losing the signal From two directions." "Yeah, but it's pretty tricky trying to work a signal-injection or signal-tracing probe into the proper points on top of the board without shorting out a couple of leads and possibly blowing a transistor," Barney pointed out. "Not if you make up some special probes just for that purpose," Mac replied. "I solder two-inch lengths of fairly stiff, small diameter wire to pinjacks or banana jacks that will slip over the end of a test probe. The wire is covered with a piece of spaghetti tubing so that only about 1/16" of the end of the wire is exposed, and the spaghetti is cemented to the wire. The wire can be bent into any shape so that the end can reach in under a transistor case to con­tact a particular lead without fear of short circuits. These special extensions will slip over the probe tips of our VOM, VTVM, signal tracer, or signal generator. When not needed, they are quickly removed. 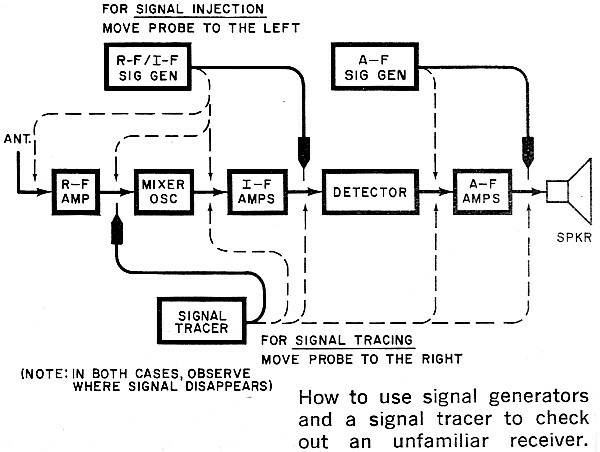 How to use signal generators and a signal tracer to check out an unfamiliar receiver. "Once the loss of signal is cornered in a small portion of the circuit, you fall back on your technical knowledge and your generalized service data to pinpoint the bad component. By 'generalized service data,' I refer to such things as transistor and cross-reference manuals put out by many transistor manufacturers. The transistor and semiconductor manuals put out by RCA, General Electric, and Motorola and others contain not only characteristics of the devices they sell but also a wealth of theory, applications, and typical circuits of radios, TV receivers, CB transceivers, hi-fi amplifiers, mixers, and so on. By comparing the voltages you find in the circuit you suspect with typical voltages shown in the manual, you can quickly decide if everything is kosher. If a signal is present at the input of a transistor and its voltages are all within tolerance, but the signal is not present at the output, it doesn't take a whiz-kid to decide the transistor is very likely defective. A transistor tester can confirm this. "I want to stress the value of such books as Sylvania's ECG Replacement Guide and Catalog, GE's Entertainment Semiconductor Almanac, Radio Shack's Transistor Substitution Guide, and Motorola's REP Semiconductor Cross-Reference Guide and Catalog. These contain the manufacturers' substitutes for both domestic and foreign transistors, together with characteristics of the recommended substitute and installation hints. One of these books is the first thing I reach for when I suspect a transistor because it will tell me what voltages I can expect on that transistor, and, if need be, what easily available substitute to use. 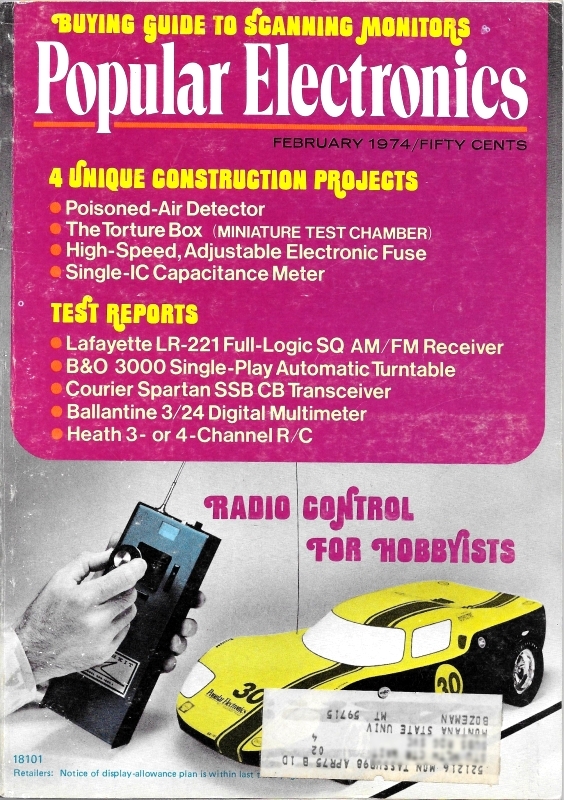 Also helpful are such catalogs as those from Lafayette Radio, Radio Shack and Calectro. "If you've gotta change a component or repair a broken connection, you still have to remove the chassis board," Barney said. "Not necessarily. In the case of a broken solder connection on a tuning capacitor lug, you can often apply heat to the top of the lug at the point where it goes down through the board and melt the solder on the other side of the board. In cases where the board is very difficult to remove because of the tuning mechanism or attachment to other components fastened to the case, I've even changed soldered-in transistors from the top of the board. I snip off the transistor leads with miniature diagonal cutters about an eighth inch or so above the top of the board, bend these over so they can't fall on through, and solder the leads of the replacement transistor to these stubs with a miniature iron. You have to decide whether it will be quicker to remove the board or improvise a repair from the top." Other Suggestions. "Here are some other helpful things I've learned: don't try transistor replacement - especially if they're soldered in - as a form of first aid. Neither should you blindly assume the fault can't be in a transistor: Three times in the last month I've encountered open collectors in Japanese line-operated output transistors. In two instances the owners were hard of hearing, and in the other case children were permitted to play with the radio. Probably operating these receivers at high volume for long periods of time overheated the output transistors in spite of their being heat-sinked. I used recommended U.S. replacements, and none of the sets has bounced yet. "Another help is to keep a card file by make and model number on these data-less receivers. List the symptoms, the service procedure by which the difficulty was found, and how it was repaired. In my file I also put such things as a short article on reading code markings on Japanese resistors, capacitors, and inductors that appeared in the November, 1973, QST. "But the thing that will really determine whether or not you succeed at this kind of servicing will be your attitude. If you're convinced servicing can't be done without diagrams and voltage data and pictures with callouts, and if you're going to waste your time whimpering about how difficult data-less servicing is and cursing the manufacturer, you'd better not tackle it. On the other hand, if you consider this kind of servicing a challenge to your technical ability and if you're willing to invest some low-return time in working out a procedure that best suits you and your instruments, you'll end up making money. On top of that, don't be at all surprised if you suddenly discover you've become a much more confident and competent service technician when working on sets for which you do have data because of what you've learned from taking on those non-pedigreed devices others are turning away. After all, any lubber can make a landfall when he has detailed charts, depth-sounders, loran, radar, and radio communication to lead him by the hand; but it takes an experienced and shrewd navigator to make port by dead reckoning!"